Friends of Chamber Music present enhakē Quartet featuring: Wonkak Kim, clarinet; M. Brent Williams, violin; Katherine Decker, cello; and Eun-Hee Park, piano. Repertoire will include music from the Baroque, Classical, and Romantic eras as well as contemporary works. The recital will be followed by a free master class at 6:30 pm at the Recital Hall. All students and the community are invited to attend the class. Possessing a knack for adventurous yet accessible programming, enhakē (in-HA-kee) has consistently distinguished itself with performances of startling intensity. Drawing its name from the Seminole (Creek) word for sound or call, enhakē has been praised for its “playing of the very highest caliber” (Fanfare) and “keen instinct for exciting programmes” (BBC Music Magazine). Their 2010 Carnegie Hall recital Made in America was lauded for its "rock solid rhythmic integrity...strengths in balance, intonation, and musicality” and described as a “polished, yet spontaneous performance" (The New York Concert Review). 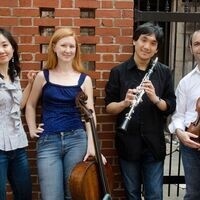 Tickets can be purchased at the door or at www.ChamberMusicFriends.org.